Does someone in your life like beer or ale? Brewbarrel might be worth considering for new years? Tara at Cattitude & Co said…..
Brewbarrel offer a wide range of home-brewing kits that any beer lover can enjoy. 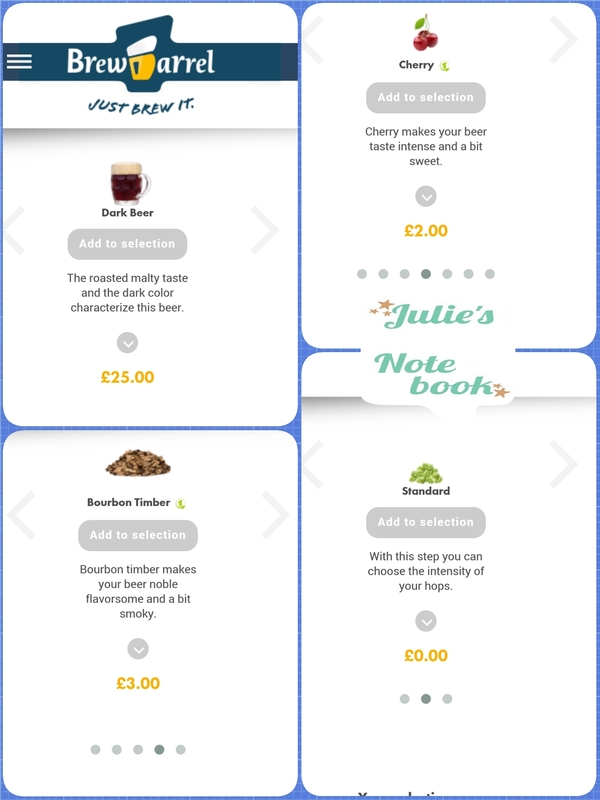 Their bestsellers include: Lager, Pale Ale, India Pale Ale, Oktoberfest Style Beer and even a kit that allows you to create your own bespoke lager. If you’re reading this and thinking “wow this sounds great but I’m lazy“, I’m here to tell you that it couldn’t be simpler. Your Brewbarrel comes with everything you need including pre-weighed ingredients. All you need to is some water and a kettle. Best of all, it only takes ten minutes to prepare! It’s meant to be ten minutes, but if took us nearer twenty to prepare ours. We chose bourbon wood chips and cherry to flavour it. I can’t tell you if it tasted okay as I’m allergic to alcohol. It was made for Blokey, who sadly wasn’t keen on the end result. To me it had a lovely smell and looked nice. It was a heady drink but I think it’s more aestheticly pleasing than a drink with less bubbles. Each Brewbarrel kits makes 5 litres of beer or ale, prices vary depending on flavourings you choose. A plain type without extra flavours is £25, you can add a few flavours if you wish and these vary from £1.50 to £3.50 each. There are hundreds of possible brews you could make so it’s truly a one off if you are creative at mixing flavours. I reckon loads of people might make Pilsner with lemon or dark beer with honey though. Go nuts, grapefruit and chilli larger is a possibility… I’m not saying it would work though. The reasoning behind the flavourings I picked are pretty logical, it wasn’t for me, was for him. Cherry for his beloved “Cherry and Whites” rugby team, bourbon wood chips as he likes his JD and it was a dark beer as he’s a real ale fan. If you want a birthday present for the kind of man who already has everything, maybe bag a Brewbarrel? Disclosure : We were sent a Brewbarrel for this review. All words my own except the quote section from Cattitude & Co.
Looks interesting. I just wonder if you’ve already tried to keep the brew for longer period of time? If yes, do Blokey had the same reaction? Looking forward to your feedback. Cheers! We did keep it a while, maybe 2 weeks. But he still wasn’t loving it. I think Brewbarrel if a great idea, perhaps I just chose a bad flavour combination?